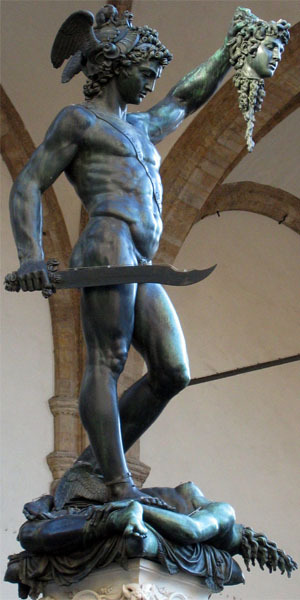 But Perseus, with the snake-haired monster's head. That famous spoil, in triumph made his way On rustling pinions through the balmy air And, as he hovered over Libya's sands, The blood-drops from the Gorgon's head dripped down. The spattered desert gave them life as snakes. Smooth snakes of many kinds, and so that land Still swarms with deadly serpents to this day. Even Odysseus was afraid of Medusa. This crafty Greek hero broke off his stay in the Underworld because he was afraid of being confronted by the decapitated head of the monster, whose glance turned anyone who saw her into stone. 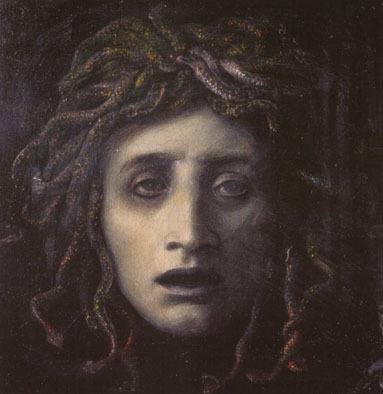 According to the Greek poet Hesiod (c. 800 ВС), who undertook to organise the myths of the ancient Greek gods in Theogony, Medusa was one of the three Gorgon sisters who dwelled beyond the Mediterranean in the far West, which is where mythology located the powers of evil to be. Due to their odious appearance and the fatal effect which they had on all who saw them, the Gorgons, like the goddesses of revenge, were the horror figures of antiquity. They contemptuously mocked everyone by sticking out their tongues and were hideous to behold: round faces with baleful eyes and hair and belts made of hissing snakes. The ancients thought these sisters were immortal, except for Medusa. Therefore, Perseus, one of Zeus's numerous offspring, was charged with killing her. He cunningly reached the home of the Gorgons and, along the way, assembled the necessary tools: a helmet that made him invisible, winged shoes that let him glide above the ground and a curved sword with which he eventually decapitated the sleeping Medusa. After he succeeded in killing her, Perseus put the ghastly head into a bag as a trophy for safe keeping, where, however, it did not remain for long. On his way home from the Gorgons, he fell in love with the beautiful Andromeda in Ethiopia and defeated a sea monster in order to save her. It was then that he felt he simply had to show his beloved the head of Medusa — though only the reflection of it in water — to prove his heroism and divine descent, which obliged him to battle evil. 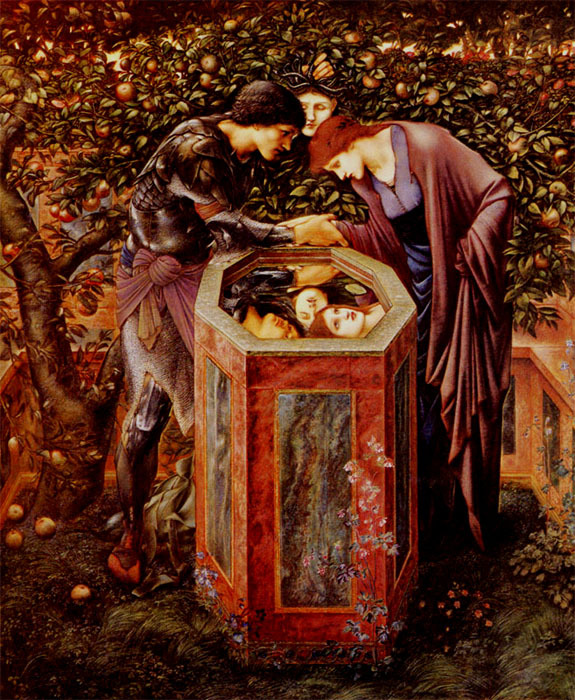 Intrigued by this ancient myth in the late nineteenth century, the English painter Edward Coley Burne-Jones executed a Perseus cycle which concluded with a work entitled The Baleful Head. Originally intended for a church, the painter may have viewed Perseus as a forerunner to the Christian dragon-slayer St George, and the idyllic and tranquil garden scene as a symbol of the desire for a perfect world, free of evil and the taint of industrialism, which was rapidly growing in the nineteenth century. Burne-Jones grew up in the industrial city of Birmingham at a time when the slums were increasing. His contemporary, William Morris, a writer and critic, stated in a 1891 lecture that artists in industrial society had to "look back" for inspiration: "When an artist has really a very keen sense of beauty, I venture to think that he can not literally represent an event that takes place in modern life. He must add something or other to qualify or soften the ugliness and sordidness of the surroundings of life in our generation." Against a background of retrogressive aestheticism, Burne-Jones formulated the following creed: "I mean by a picture a beautiful romantic dream, of something that never was, never will be — in a light better than any that ever shone — in a land no one can define or remember, only desire and the forms divinely beautiful." Perhaps The Baleful Head represents a visionary prescription for dealing with a world out of control.